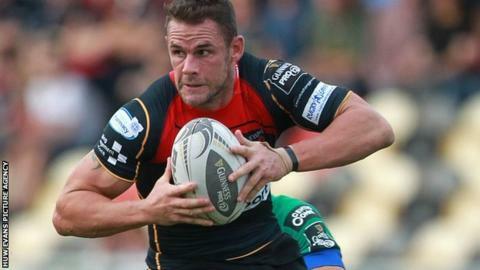 Captain Lee Byrne is celebrating after achieving a feat with Newport Gwent Dragons he never managed with Clermont Auvergne - winning at Stade Francais. The Dragons ran in four tries and secured a bonus point with a 38-22 victory over the Top 14 side in their European Challenge Cup opener. Byrne, 34, joined Dragons in the summer after three seasons in France. "Some of us, including myself, might not have a chance to come here again and get a win like that," he said. "I never did while I was with Clermont and I'll probably never have a chance to come back here. I'm so happy for the young players." Dragons have won just one of their six Pro12 games since Byrne's return, while the full-back has been troubled by a shoulder injury. But tries from Richie Rees, T Rhys Thomas, Hallam Amos and Nic Cudd secured a famous victory for the Men of Gwent in Paris. Byrne said: "It's been six, seven, eight weeks of being under pressure but we know how hard we've been training and it finally clicked. "I told the likes of Hallam and Angus O'Brien to remember this because it doesn't happen often. "Stade didn't have their best team out but we've come to their home ground and put nearly 40 points on them." Scrum-half Rees, who produced a trademark cheeky dash to score the first try, was named man of the match. But the Wales international was keen to pass some of the credit to 20-year-old half-back partner O'Brien, who kicked 18 points on his European debut. "I thought Angus was superb, he kicked for corners when we wanted to and he played when we wanted to," said Rees. "He performed on the big stage - it doesn't get much bigger than Paris on a Saturday night against Stade Francais." Director of rugby Lyn Jones also praised fly-half O'Brien, who came up against South Africa international Morne Steyn in the second half. "I'm especially delighted for Angus, with a lot of pressure on him against Steyn," he said. "To outshine him was all credit to him." Newcastle Falcons head to Rodney Parade on Friday on the back of their own bonus-point win over Bucharest Wolves. And Jones knows the importance of a second victory before the December double-header against the Romanian group minnows. "We have to back up this performance otherwise it's a waste of time," Jones said. "We have to buy time to win some games and simultaneously allow injured boys time to come back into the fray. Then perhaps we can go further in this competition." One concern for Jones is the fitness of Wales lock Andrew Coombs, who limped off after coming down awkwardly from the first line-out of the game just four minutes in. It marks a continuation of the Dragons' bad luck with injuries to their centres and locks - with four players in each position injured.